I always say that what I like best about sailing and being at sea are the long passages. I was tempted to describe the current passage from Victoria, in British Columbia, to Dutch Harbor, in the Aleutian Islands, as the exception because of a frustratingly slow start when we had to contend with contrary winds and current and had to use the engine more than I would have liked. 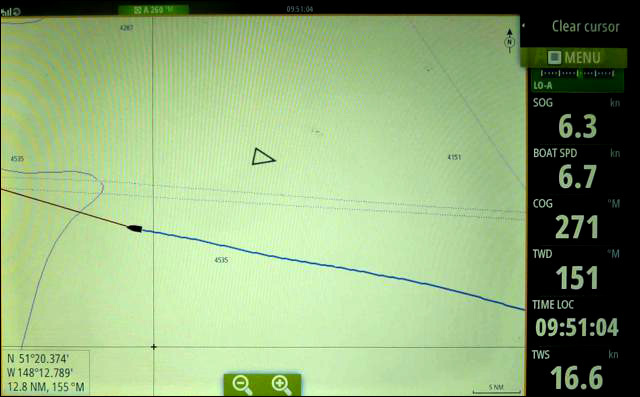 However, after a few days, favourable winds set in and I am pleased to say that in the last 24 hours Aventura has sailed for the first time a total 191 miles in that span of time. This is the best 24-hour mileage and is just one mile short of an average of 8 knots, some of it with the help of our large Parasailor spinnaker. I decided that for those who are following our voyage I should describe our life on board. First of all, contrary to what some people may imagine, we live what can only be described as a normal life. With this in mind, Aventura has been designed and equipped to make life on passage both comfortable and pleasant. We have regular meals interrupted by regular watches, a pattern that I have inherited from the days when we sailed with Gwenda in company with our two children, Doina and Ivan. Because of their presence we had to lead as normal a life as possible. I have been following the same routine even when I am not sailing with my family. I must admit that some of my crew find this surprising and may be even irritated by my insistence on having a regular routine and abiding by it. 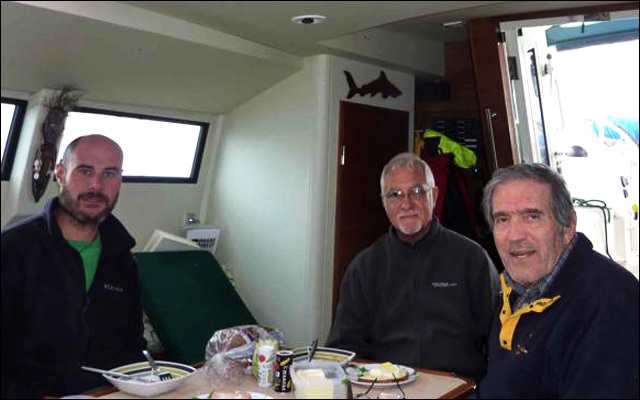 For example, whenever sailing conditions make it possible, we have our meals together at the table, with proper plates and cutlery, and even napkins. My current crew is Dunbar, originally from South African but who spent the recent years in London. 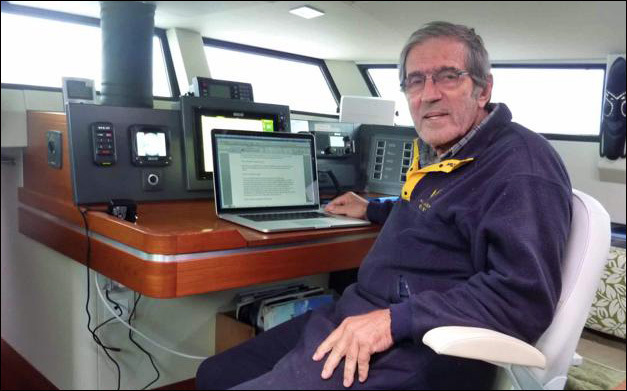 He joined Aventura late last year having sold his own boat to accompany me on this voyage. Pablo is a friend from Miami, originally from Cuba but lived most of his life in Florida. 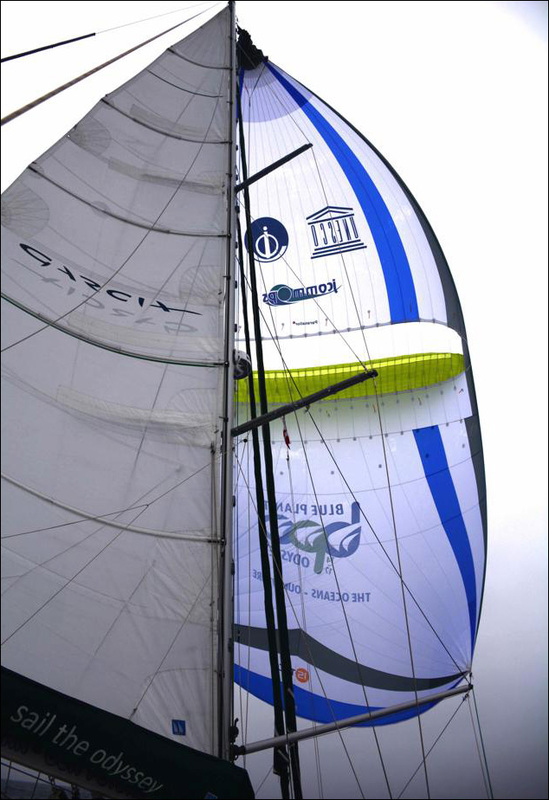 He is a keen racing sailor and has helped me much in the US and Panama with the organisation of the Blue Planet Odyssey. 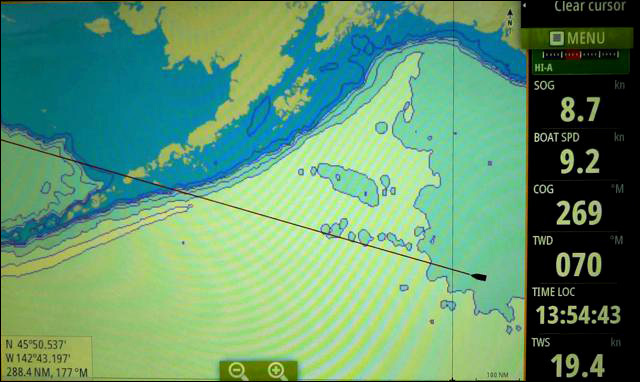 AIS snapshot: the black vessel is Aventura, showing its course and track, while the white triangle above is a ship that had just passed us on an opposite course at distance of some 15 miles. 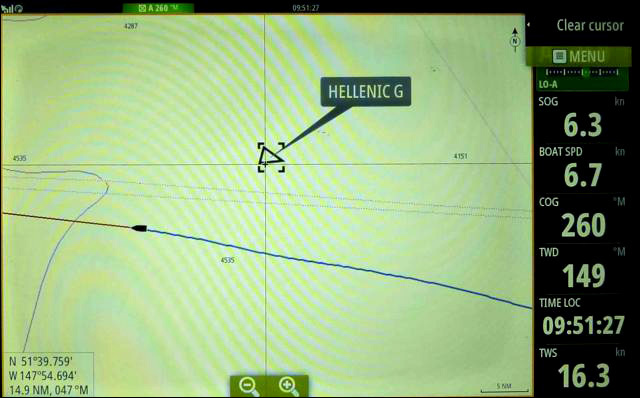 A click on the triangle shows the name of the vessel as being HELLENIC G.
… and another click on its name gives all necessary information: its distance from us, if there is any risk of a collision course, the time when it will pass us, its course, speed, port of departure and destination, etc. 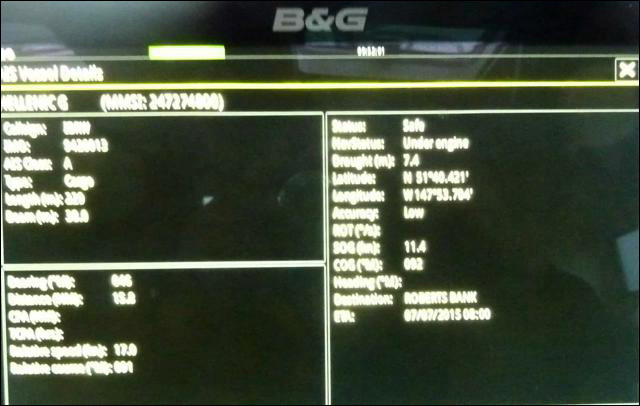 Similarly, the person on watch on Hellenic G will receive the same information about us. Safety aspects have improved enormously since my early days of sailing, and life has become so much easier with the help of radar and AIS (Automatic Ship Identification), both highly appreciated yesterday when, for a while, we were sailing in thick fog, and still could clearly see on our monitor a line of ships just to the south of us heading for Japan and China. Nevertheless, there is always one of us on watch. We keep three hours watches at night while daytime watches are two hours long. 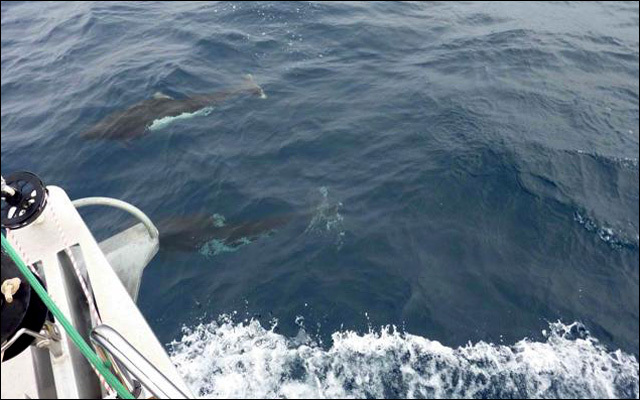 Dolphins riding Aventura’s bow wave. One of the main attractions on passage is watching for wildlife. 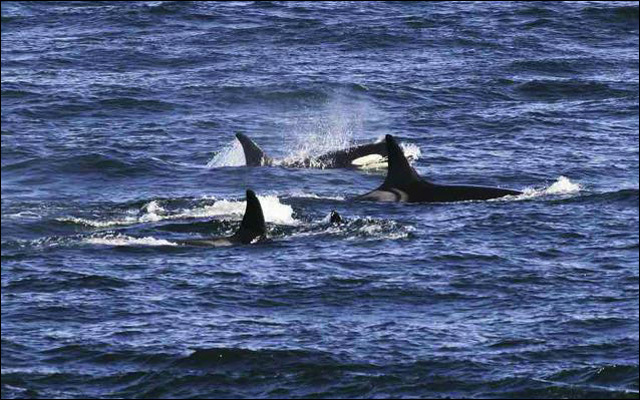 We were lucky to have a large group of dolphins frolicking around the boat two days ago, to be followed by a large pod of orcas or killer whales. Although quite close, I failed to get any good photos, so I shall make up for that by showing some of those I took not far from here, when we sailed with Ivan on the previous Aventura to Alaska in 1999 at the end of a 12,000 miles long voyage from Antarctica. 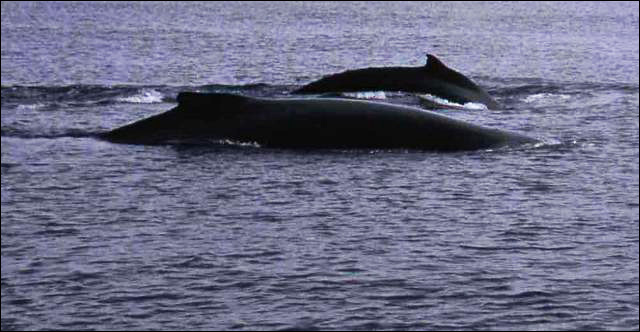 We later passed close to a couple of humpback whales, who from the way they were behaving seemed to be unaware of our presence, possibly being asleep. It’s not just safety features that have improved so much but also communications. I have a satellite communications system that can handle voice and data transmissions via the Iridium satellite network. It also allows me to receive quite large data files. This means that I can easily download weather information and forecasts, as well as the daily ice report for the Northwest Passage. Jimmy emailing his latest report.